The alarm went off at 8am, but I quickly hit snooze. Finally about 8:30a, I rushed to get up and get ready, so we wouldn’t miss our full English breakfast. I’m not one to really eat breakfast at all, but Katia assured me it was something I had to experience. 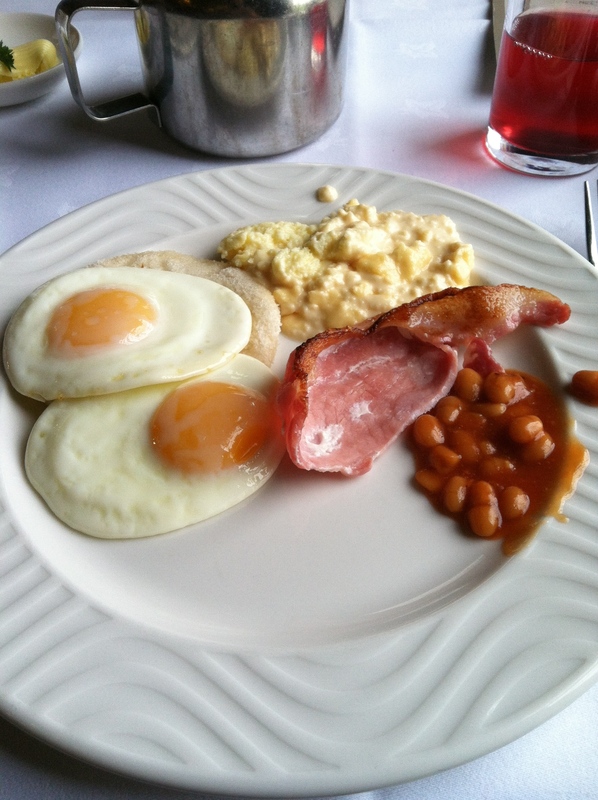 There were two long buffet tables full of sunny side eggs, scrambled eggs, black pudding, English bacon (which is really ham! ), bangers, baked beans and other assorted goodies. There was quite a nice juice bar as well, from which I had delicious cranberry juice. I hate cranberry juice cocktail and it’s almost impossible to get just juice here in the States, so that was a nice treat. It was grey and a big foggy around the green as we sat by the window, enjoying our breakfast, but Katia was quick to reassure me that it would likely burn off by lunchtime. We left our bags at the hotel until we heard back from the porters’ lodge and ventured into Cambridge for a full day of sightseeing. First stop was the mobile phone store to get a sim card for the old phone I was going to be borrowing from Katia while in the country. As it was a bit chilly still and all Katia’s coats were in her bee-infested flat, we then did some shopping. I found a delightful dress at Dorothy Perkins, but held off on trying it on since it was my first day and I didn’t want to spend all my money too quickly. Katia got lucky with a new lovely trench at Jigsaw. After the shopgirls heard her tale of bees, one of them went to the attic and found a trench from last season (and therefore on sale) that was smashing! I’m sad to say that after that first day, she didn’t have occasion to wear it while I was there because it was just too warm, but it’s fabulous nonetheless. After our brief shopping excursion, we checked in with the porters’ lodge and the housekeeper and found that they would be dealing with her flat after lunch. 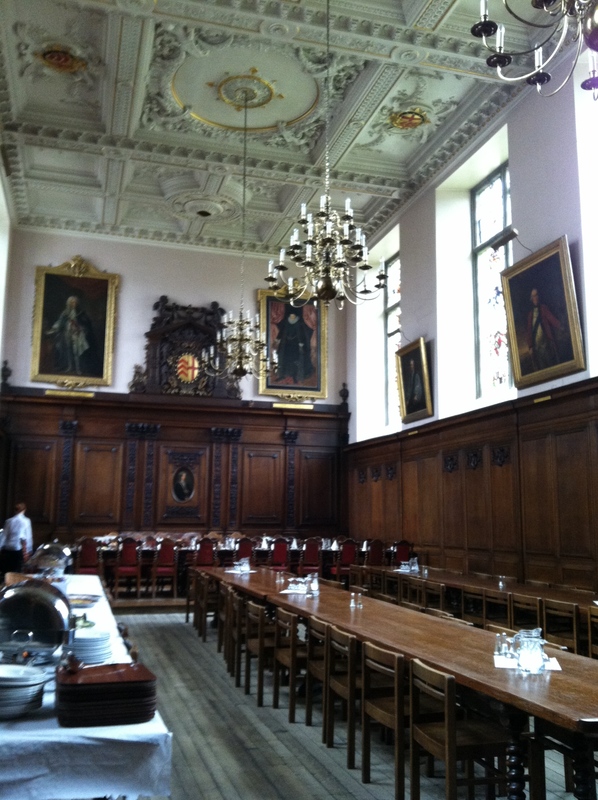 Katia gave me a great tour of Clare College, including the fabulous dining hall that looks straight out of Harry Potter (a feeling that would stick with me for most of the day!). This was extra special because as a rule, the college of Cambridge are not open to tourists, especially not during exams (which it was). But I got to blend in (and geek out) with Katia and her college ID. I should stop here and explain that medieval European history was my primary concentration of my major in college and I wrote my senior proseminar paper on the rise of education in medieval Europe, so being able to walk the grounds of these famous college was surreal. 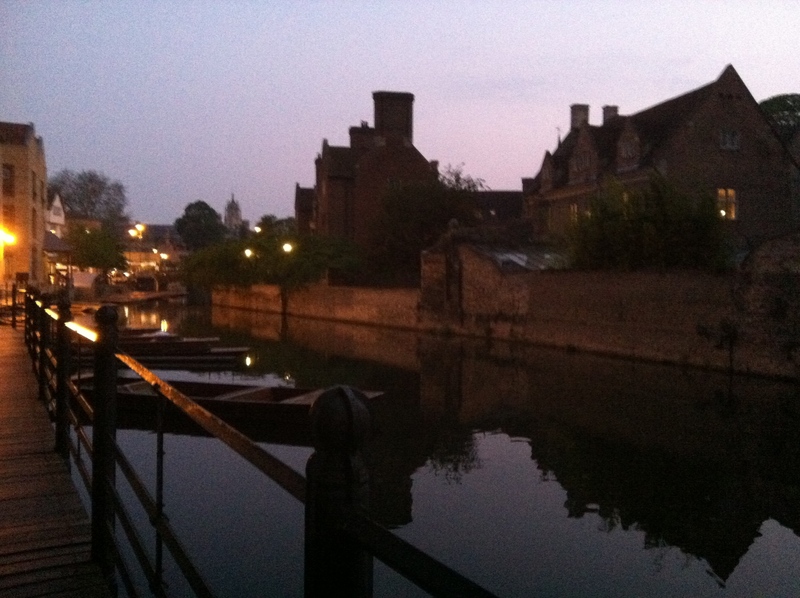 Following Clare College, Katia took me to past the library and the Stephen Hawking building. She has not yet had a Harking sighting, but apparently they are more common than one might think. 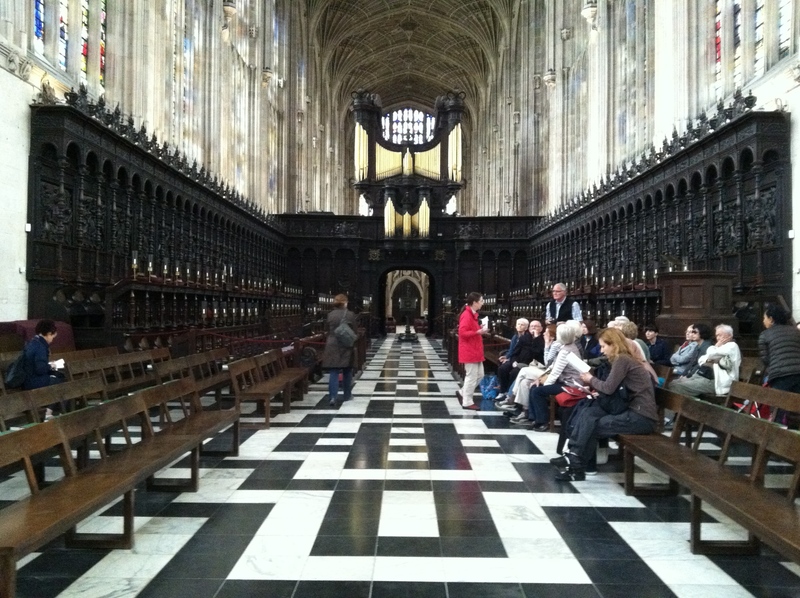 From there we headed to Kings College, stopping in particular at the Kings College Chapel. The fan vault ceiling is particularly spectacular and I had to fight the urge to lie down in the aisle and just stare at it for an hour. 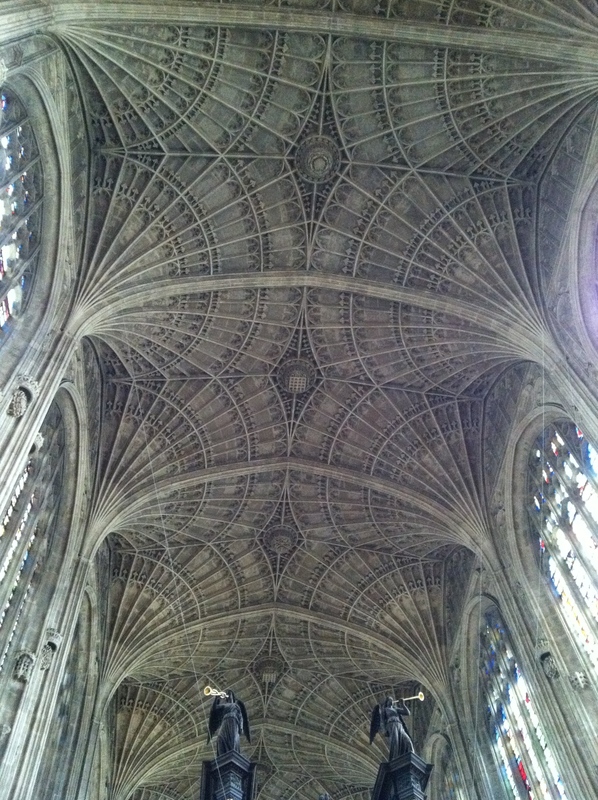 The Chapel is also home to the famous Kings College Choir, which you may have heard on Christmas Eve. 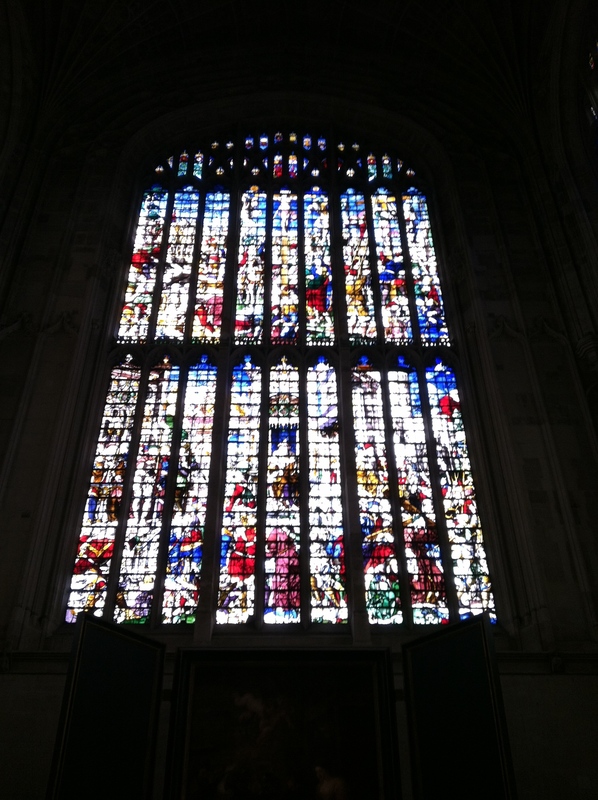 Kings College Chapel is said to be one of the three best churches in Europe for stained glass (the others being Notre Dame in Paris and Chartres Cathedral) and while I’ve not been to all the churches in Europe, I have to agree with the assessment. Even on the gray morning we were having, the windows were bright, shining, and brilliant. My jaw hung open as I tried to capture their beauty on my iPhone, not sure where to look first. Minding the step on the way out that I did NOT mind on the way in, we left Kings College Chapel for a quick walk around the campus of Kings College. 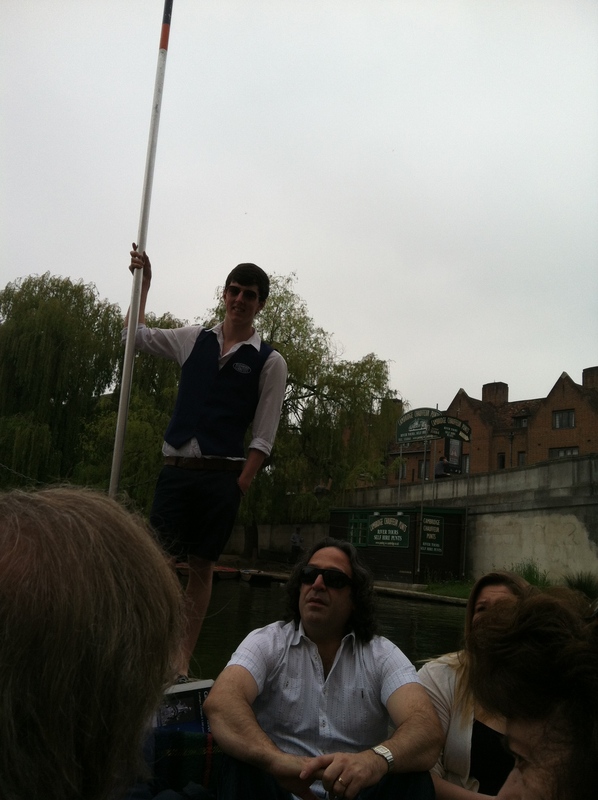 The punt tour left us off right in front of The Anchor and Katia decided we should participate in another British tradition, the pub lunch! Not being much of a beer drinker (I know, I know, don’t tell! 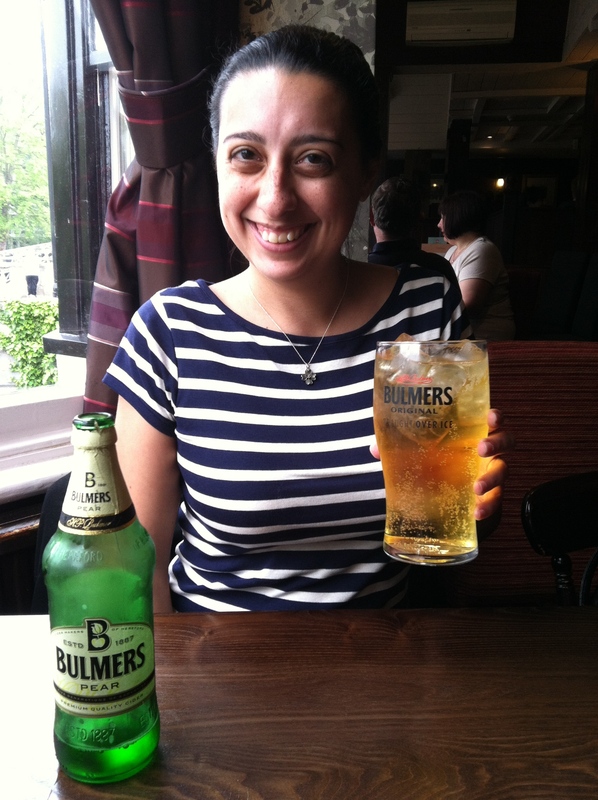 ), I opted for a cider and it was DELICIOUS! I also opted for a chicken Caesar salad, which was definitely chicken with lettuce, but not Caesar as far as I could tell. The dressing actually tasted like bacon ranch, which is odd, since they don’t have real bacon in England. Anyway, it sounds like I’m complaining, when in fact, it was also quite scrumptious. While at lunch, Katia got a call from the porters that her flat was sorted, so we spent the next hour retrieving our bags from the hotel, heading back to the hotel and changing for our evening plans. There were a few (dead) bees left on the floor, but Katia quickly retrieved the vacuum cleaner and we made them history. After inspecting the flat fully to determine that all bees had been dealt with and we would not be coming home to any buzzing surprises, we quickly changed into more formal attire and headed back into the city centre. Our first stop for the evening was Wednesday Evensong at Kings College Chapel. I was raised United Methodist, which is an offshoot of the Church of England, so I usually feel quite comfortable in such a service. I was also a member of a choir for all of my formative years into college, so I have a good ear for choral music. But this service was unlike anything I’d ever experience. Lasting just about an hour, there were a few places for the congregation to respond, but for the most part, we were a delighted audience for the spectacular call and response between the choir, its soloists and the priest leading the service. It was one time I was tempted to ignore the ban on recording because the sound in that building was mesmerizing. I’m mostly a Christmas-only Christian at this point, but it was a profoundly spiritual experience. 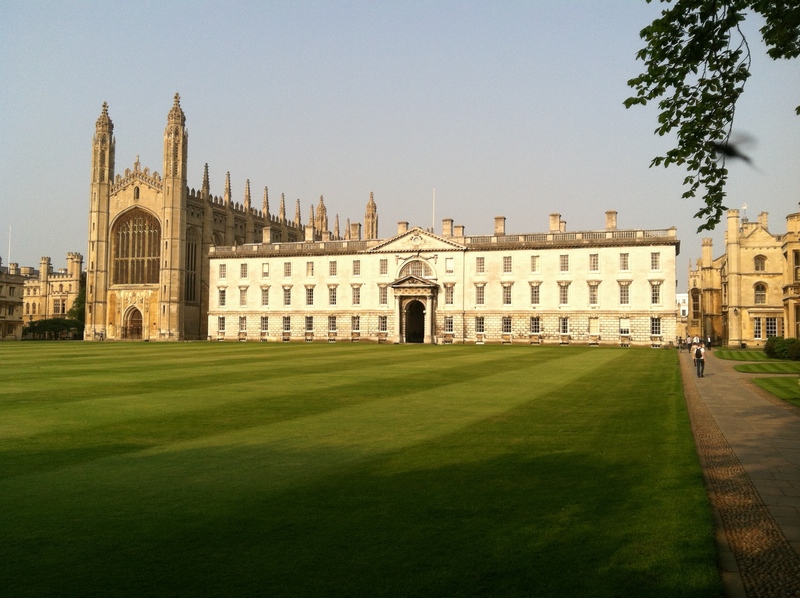 I can’t imagine being a student at Kings and getting to go there every day if I wished. Following Evensong, Katia walked me over to Trinity College for another tour. The sunlight was brilliant on the buildings and I couldn’t stop exclaiming how beautiful everything was. 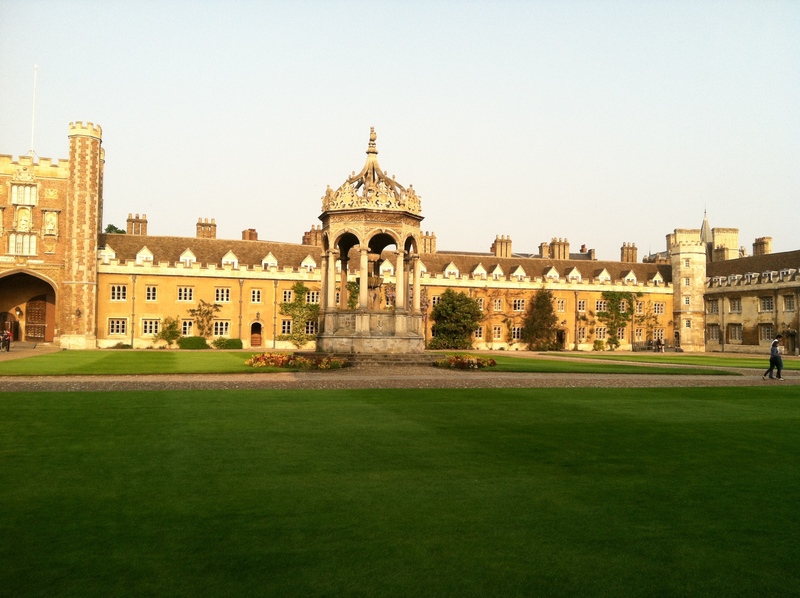 Trinity is the largest college in Cambridge and the richest. It was here that I also started to really have the history of Cambridge fall on me, looking at the notable alumni including Isaac Newton, Sir Francis Bacon, Niels Bohr, Lord Byron and Lord Tennyson to name a few. Thirty-one Nobel Prize winners and five Fields Medalists in the 20th century were members of Trinity. Just the thought of all of those academic heavyweights attending classes here was daunting and surreal to say the least. After allowing me time to properly ooh and ahh over Trinity College, Katia and I walked over to Darwin College (yes, that Darwin), where she will be a fellow in the fall, for Wednesday night Formal Hall dinner. On Wednesday and Friday nights, members of Darwin College can elect to wear their robes and attend a formal, four-course dinner with their colleagues. I was nervous about dining in a such a formal atmosphere, but it turns out my fears were mostly unfounded. Because it was a Wednesday night, dinner was served in the upstairs dining room, which is clearly part of the old house, making the experience that much more unique. There were about 25 people attending dinner, most of whom were M.Phil. students who knew each other (but not us). Katia and I used the opportunity to have our full discussion of NY-LON, which was quite lovely. Dinner was also amazing, but after a full English breakfast, pub lunch and now a formal dinner, I was feeling quite stuffed. I was proud to say that I knew which silverware and glasses to use throughout, so my etiquette training from high school finally paid off! We finished our after dinner drinks around 10p and headed back to (bee-free!) Katia’s flat to book our train tickets for the rest of the week and get some sleep. What great fun it is to read your chronicle, Jenny! Thanks for sharing this experience in such loving detail.